During this week, the Dry Tortugas has proven once again to be a very special and exciting birding location. While wandering the islands, our group happened upon a strange-acting, bright-colored bird that bewildered our birdwatchers. This bird was flicking and fanning its tail while displaying the white spots on its outer tail feathers. It turns out this bizarre and unusual-acting bird was a female Hooded Warbler, who was just using its tail-flicking technique to capture its prey, and, of course, entertain its audience. After spotting this small, striking songbird, she quickly became our favorite bird of the week. The adult male Hooded Warblers are an olive-green color on top with bright yellow underparts, a black hood and throat, and a bright yellow forehead and cheeks. The female has the same coloring but lacks the hood, and has varying degrees of black coloring around the crown or throat. Older females sometimes look a little like the males, but their hood is never as extensive or complete. This little guy is only about five and one-half inches, but it carries a loud, piercing, and very melodious song. 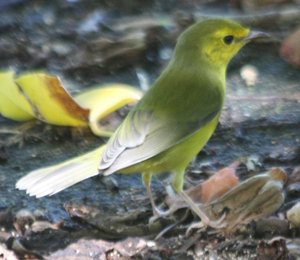 The Hooded Warbler breeds in the eastern United States and southern Canada and prefers shaded habitats, probably because of the size of this warbler's eyes. Among warblers breeding in the United States, the Hooded Warbler has the largest eyes, which possibly explains its aversion to well-lit habitat types. They are also among the largest of the warblers boldly standing out by their bright yellow faces. Part of its scientific name, citrina, relates to its dazzling yellow color. Male Hooded Warblers defend their feeding and nesting territories and usually attract only one single mate. While some males remain unmated, some have two females at the same time in their nesting bed. Their well-hidden nest is constructed of dead leaves, strips of bark, and grass, and held together with the help of spider webs. The eggs are incubated by the female for 12 days, and the male supplies nearly all the food to the female and the young, which consists of spiders, insects, and other small arthropods. The threat displays of the Hooded Warbler's bright plumage patches alarms the insects which quickly attempt to escape. When they do, the warbler chases them and usually catches them in flight. After about nine days of hatching, the young leave the nest and are attended to by both parents. For a most enjoyable and fun-filled trip, board the Fort Jefferson ferry embarking from Key West and travel the beautiful emerald waters of the Gulf of Mexico to the most inaccessible national park in the United States. Prepare to be amazed at some of the very best birding on the planet.